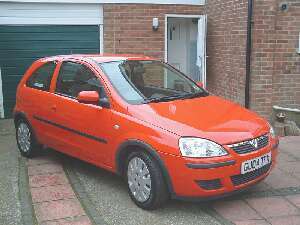 Description of car for sale : Vauxhall 2004 O4 Corsa Active Manual petrol Flame Red £5,200 9,600 miles, "2004 VAUXHALL CORSA 1.0 12V Active 9,600 Miles, 3dr (04 Plate), Flame Red, Air-Con, CD Player, Alloys, Xenon Headlights, Tax Sep06, Just Been Serviced By Vauxhall. Hastings Based. �5,200. Ono"